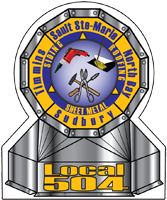 The Director of Apprenticeship has for many years appointed Local 504 full time Officers to sit on the Provincial Advisory Council for the trade of sheet metal as well as the trade of roofing. Our participation and expertise has played a significant role in apprenticeship training in Ontario. Local 504 has helped to improve the health and welfare plans for all its members and their families. The Local also strives to promote a safe and healthy work environment.